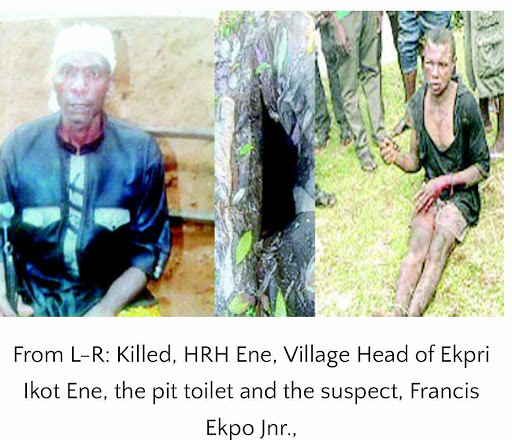 Francis Ekpo Jnr., butchered his father, HRH Francis Ekpo Ene, and dumped his remains inside the family’s pit toilet, for persistently accusing him of stealing his money without facts. Vanguardngr gathered that the killer-son supposedly acted under a powerful and diabolical influence, as he was not known to be a violent person before the incident. The wife of the deceased, Affiong Offiong Asuquo, said: “The problem started when my husband’s money started missing and he had always thought that it was his first son, who was responsible for the theft, not knowing that he was not the person involved, and he had always denied being the one. She confided in Vanguardngr that the money was actually being stolen by their daughter, who after her escapade, disappeared to her boyfriend’s place and returned after they exhausted the cash, pretending as she knew nothing and the late villager head would rail accusations on the epileptic son. She said the boy had always said: “One day; I will slaughter you and throw you inside the toilet for accusing me wrongly.' All these came to pass that night as the father started shouting at him to provide the money he took from his room, the boy got angry and picked up a cutlass and killed him."